Hasnat Karim and his two children who were with him and his wife when the attack took place. The wife of a British man accused of taking part in an Islamic State siege in Bangladesh that killed 20 hostages has told ITV News he is an "innocent victim of a terrorist attack". Sharmina Parveen, wife of Hasnat Karim who was arrested over the Holey Artisan Bakery attack in Dhaka, said that they were with their two young children when gunmen stormed the restaurant. She said that they had only just sat down to celebrate their daughter's 13th birthday - turning a "joyous occasion" into a "nightmare". "We heard gunshots and screams coming from outside the restaurant. We were terrified," she said. She added that she and her family will never be able to recover from that "terrible night" on July 1 and insisted that she is fully confident her husband will prove his innocence. Describing the bloody attack, where militants tortured and killed people who could not recite verses from the Qu'ran, Mrs Parveen said: "My children, my husband and I did exactly as we were told and heard the gunmen proceed to shoot and kill the foreign hostages around us." 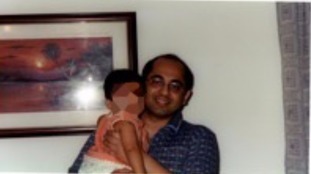 Hasnat Karim with his daughter when she was a baby. The militants asked them whether they were Muslim and Bangladeshi and when they said yes, they were told they would not be harmed, she said. "My children, my husband and I did exactly as we were told and heard the gunmen proceed to shoot and kill the foreign hostages around us - there was blood everywhere." The family were held in the restaurant until the siege ended at 7am when security services stormed the building and killed the attackers, she said. "Since this terrible night, which I do not think we will ever be able to recover from, my husband has been take from us. My husband is an innocent victim of a terrorist attack." On Thursday, a Bangladesh court permitted the detention of Mr Karim, a 47-year-old engineer, alongside Toronto student Tahmid Hasib Khan, 22. The case has drawn criticism from human rights groups who say the suspects, who were dining separately, were illegally detained and denied access to a lawyer. Mrs Parveen said the family has not had any contact with Mr Karim since July 13 when she was allowed to visit for five supervised minutes. "We have been extremely worried since and my children keep asking when their dad will come home," she said. Rodney Dixon QC, representing Mr Karim, who holds dual British and Bangladeshi citizenship, said: "The authorities have finally admitted that Mr Karim is in their custody. They have had more than sufficient time to make any inquiries. There is clearly no evidence to charge him and he should be let go without any further delay." Hostages from Italy, Japan, America and India were killed in the 12-hour siege on July 1 alongside two Bangladeshi police. Karim and Khan were among 32 survivors rescued by police and taken into custody for questioning. Police released the others soon after, but the two men's families said they had not returned.